Quantum computers will soon be able to perform tasks that not even the most powerful classical computers are capable of today. An interdisciplinary team of researchers at Colorado School of Mines has received funding from the National Science Foundation to develop a new architecture for quantum computers that are significantly faster than existing ones. The key, they've theorized, is creating a carefully engineered complex network of qubits, the quantum version of bits. "We're looking at a new type of quantum computers where the qubits are connected to each other, as opposed to just connected to their neighbors. That's a big difference," Physics Assistant Professor Zhexuan Gong said. "The main question we're asking is if you use all these additional connections in a complex but clever way, can you speed up a quantum computer dramatically?" Gong is the principal investigator on the project, which has been awarded $985,926 over three years through NSF's Research Advanced by Interdisciplinary Science and Engineering-Transformational Advances in Quantum Systems (RAISE-TAQS) program. Joining him as co-PIs are Physics Professor Lincoln Carr, Applied Mathematics and Statistics Assistant Professor Cecilia Diniz Behn and Physics Assistant Professor Meenakshi Singh. 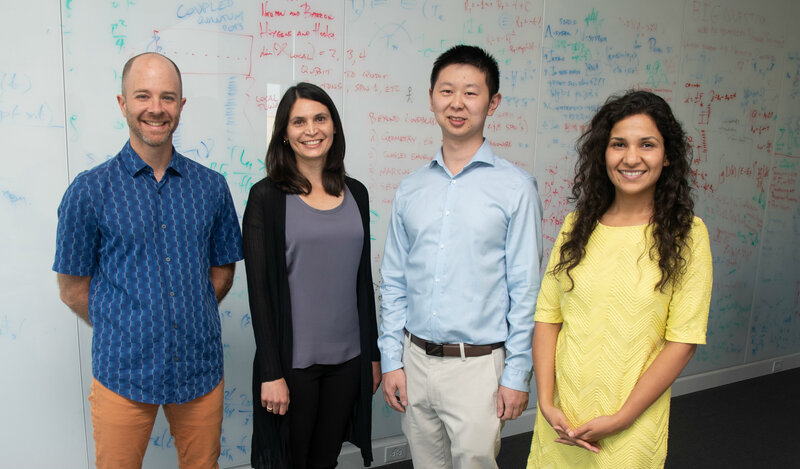 Two graduate students and six to eight undergraduate students will also be funded through the award, along with the equipment Singh needs to implement a small network of highly connected qubits in the lab. "In a quantum computer like the 6-qubit computer that we are currently working on with NIST in Boulder, if you want to send information from Qubit 1 to Qubit 6, you would need to send it first to Qubit 2, then to Qubit 3, 4, 5 and eventually 6, taking at least five units of time," Singh said. "What Zhexuan is proposing is to connect all qubits with each other and do it in a way that takes less than one unit of time." "The existing quantum computing architecture is like having only one road that goes from City A to City B and then to City C," Gong said. "The new architecture we are adopting will have an additional road built directly from A to C, which allows you to get faster from A to C without the middle stop. But more importantly, in the quantum world you can travel simultaneously along the one-stop and nonstop routes. The resulting speed is faster than the speed of either route and we want to understand such speedup for the case of not just three, but many cities." The team aims to show how high qubit connectivities can be employed to massively speed up quantum information processing, focusing on mathematical quantum speed limits, optimal physical protocols and experimental demonstrations. They will also study states created by quantum systems with such high connectivities, quantifying their complexity and understanding their entanglement structure. "Our approaches will leverage ideas from complex network theory to develop the tools and measures needed to investigate the properties of networks arising in these quantum systems," Diniz Behn said. In addition to the theoretical and experimental work, the team will develop curriculum for a potential graduate certificate program in quantum engineering, aimed specifically at addressing the growing needs from industry professionals to gain the expertise required to work on quantum technologies. "There are a lot of companies, some even here locally, that are putting out job advertisements for people who know how to build a quantum computer — companies including IBM, Google, Microsoft, Alibaba, Northrop Grumman, HPD and Honeywell," Singh said. "That requires knowledge of both engineering, in particular cryogenics and microwave electronics, and quantum information science. Typically, you know one or the other. Very few know both. We hope to educate students and professionals with both fields of expertise." The undergraduate quantum mechanics course Gong is currently teaching at Mines will also be redesigned as part of the project, with an emphasis on quantum information. "We really want Mines to be at the vanguard of creating a quantum-capable workforce," Carr said. "We're really in a unique position with our industry connections to create a graduate certificate program here. You don't need a PhD to engage with quantum computing." The award is part of a $31 million investment by NSF into fundamental quantum research. The RAISE-TAQS awards will support 25 projects for innovative approaches, experimental demonstrations and transformative advances that will help lead to systems and proof-of-concept validations in quantum sensing, communication, computing and simulations. Another eight awards, through RAISE-Engineering Quantum Integrated Platforms for Quantum Communication (EQuIP), will support projects to push the frontiers of engineering in quantum information science and technology.